A lowered Shelby GT500 looks menacing sporting its new set of shoes. 2009 Shelby GT500 owner Robert from San Gabriel Valley, California, was looking to put some new life into his muscle car and he thinks he has found the ultimate solution - an engine tune and a new set of Vossen wheels. The Shelby GT500 has been finished in Vapor Metallic Silver with ebony stripes, which fit nicely with the new 20-inch matte graphite silver Vossen CV3 wheels. Wrapped in Nitto Invos rubbers, the wheels leave enough room to see the Brembo brakes clearly. The bigger Brembo brakes are absolutely necessary, as the Shelby&apos;s engine has been tuned by Racers Edge Tuning up to an impressive 553hp. The muscle car features a TruCarbon Venom hood, splitter and side skirts and a MagnaFlow exhaust system. The car has been lowered thanks to a RideTech RidePro e3 Air Bag Suspension. 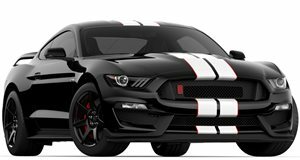 Check out his finished 2009 Shelby GT500 and let us know what you think about his powerful and well-customized muscle car.